When I began planning our family trip to Africa way back when in 2014, I knew that I wanted to incorporate some sort of charitable giving into our travels. What I didn’t know at the time was just how much of a profound impact this journey would have on all of our lives. I stumbled upon Pack for a Purpose on a travel forum while doing research for our trip and thought, “Wow! This seems like a great idea!” I checked out their website and, sure enough, found that two of our camps in Tanzania participated in the Pack for a Purpose program. JACKPOT! Our trip was literally almost a year away, but I knew I found the perfect way to make our family travels more meaningful. I was so inspired by the whole Pack for a Purpose concept that I reached out to see if they might need any additional volunteers. Let’s just say the rest is history and I am now lucky enough to call myself an official volunteer and am so honored to be a part of this amazing program. We arranged our itinerary so that we would be able to use ALL of our checked international luggage allowance to bring donations. 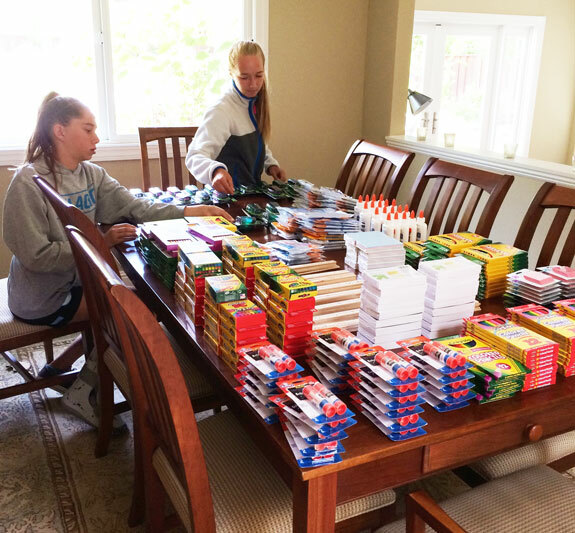 This meant that including myself, my husband, and our two teenage daughters, we would be able to bring 400 pounds of supplies to the two schools we were visiting. 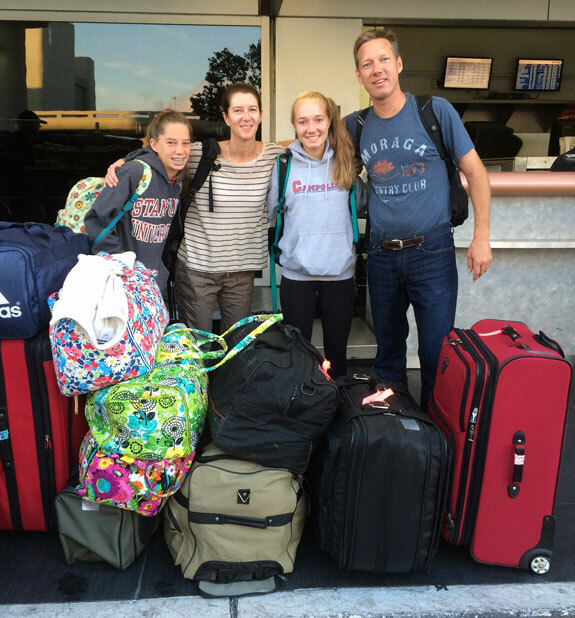 We reached out to friends, family, the girls’ teammates, and did a ton of shopping. 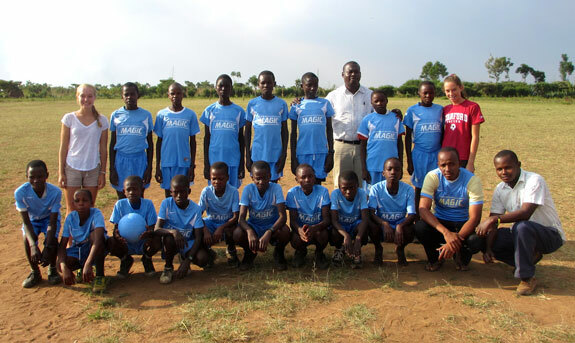 My daughters are both avid soccer players and we knew we wanted to bring soccer balls and uniforms to each of the schools so we also reached out to the One World Play Project and they generously donated 10 of their indestructible soccer balls specifically made for use in third-world countries. After several weeks of collections, we began to organize. Let’s just say that 400 pounds is A LOT! We ended up with eight large suitcases filled with over 100 pounds of new school supplies, first aid equipment, reading glasses, sanitary napkins, solar lanterns, 16 soccer balls, 10 volleyballs, inflation pumps, two complete sets of soccer uniforms, backpacks, baseball hats, shoes, clothing, and over 100 sports jerseys. With everything packed up and evenly divided, it was time for the real adventure to begin. After almost 30 hours of traveling we landed in Tanzania along with all of our luggage… Whew! Half of our donations were picked up and transported by Serengeti Bushtops to await our arrival in the Serengeti four days later. We took the other half with us directly to Chem Chem Safari Lodge, which supports the first school we visited. We were all so excited as we drove up to the first school in the village of Vilima Vitatu and saw the children waiting outside. They were so curious, some shy and some very excited, too! I cannot say enough great things about Chem Chem and the work they have done with the school. It is newly painted, bright and colorful with vibrant, educational murals painted on the walls of the school. There was a mural of a large map on the wall and the kids pointed out (after lots of discussion!) where our home state of California was. We had a very organized visit here and our girls were able to interact with the students by writing math questions on the chalkboard and sentences in English for the students to translate. It was so fun for our daughters to be able to directly engage with the kids. With the teacher’s encouragement, we handed out some of the supplies to the children and they sang a few songs for us and ended by singing the Tanzanian national anthem. It was incredibly touching and ranks up there as one of our most memorable moments on the entire trip. We handed out a set of soccer uniforms and the kids put them on and headed outside to play. One thing we did (which I highly recommend) is brought an instant camera. Most of the people we met had never even seen a picture of themselves, much less had an actual photograph. So we took pictures with the camera and handed them out to the kids. They LOVED it! Our girls joined in the soccer game for a bit before we had to head out. It was a moving and inspiring visit to say the least. Several days later we met up with the rest of our donations in the northern Serengeti when our guides from Serengeti Bushtops picked us up at Kogatende airstrip. Our safari vehicle was loaded to the brim and we were lucky enough to enjoy an amazing game drive along the way to the school. My idea of multi-tasking! When we finally arrived at the school, it was 4:00 on a Friday afternoon. We were super late but all of the kids were still waiting at the school for us. It was an incredible welcome. Our visit here was much less official but we met with the teachers, went through all of our donations, and visited several classrooms. 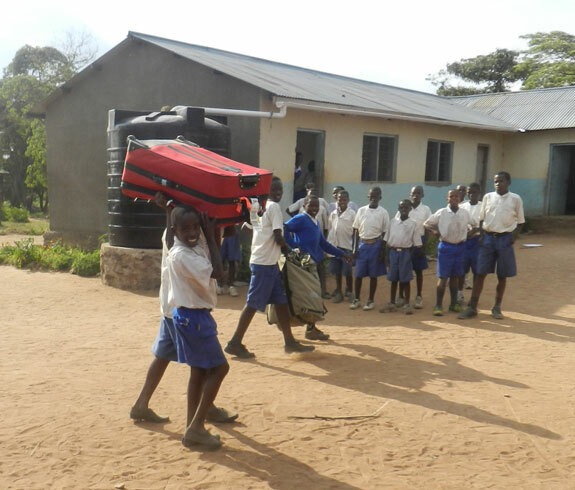 This school was much, much poorer, which made our donations even more meaningful. They had one soccer ball for over 500 students so they were thrilled when they saw all of the balls we were donating along with the set of uniforms. 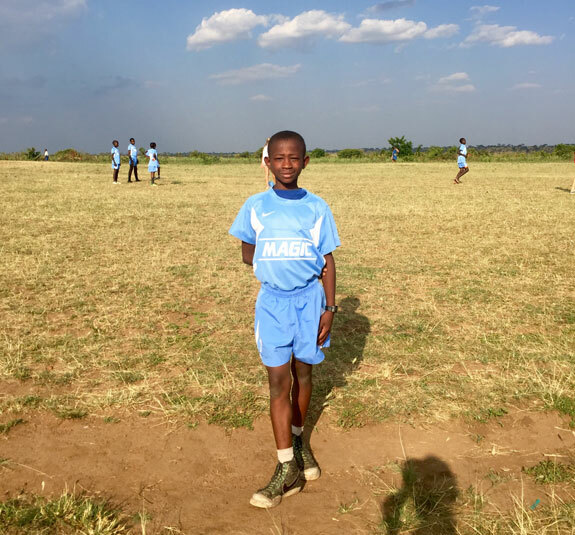 We asked if we could play a quick game of soccer so jerseys were handed out to the boys on the school team and we headed to out to their huge, grassy soccer field to play. I cannot even begin to describe how incredible this was. It was late on a Friday afternoon and the field was lined with over a hundred students and people from the village watching. They were probably coming to see why their children weren’t home yet! The teachers and our guides played along with our daughters and the 17 boys wearing their first ever set of matching uniforms. Another top memorable moment? You bet! It really is hard to describe how amazing this whole experience was for our family. It made all of us realize how much we have and take for granted, how lucky we are, how little it takes to significantly impact another person’s life, and just how good it feels to be able to give back. We had an incredible trip to Africa and I cannot express how deeply participating in Pack for a Purpose enriched our experience from start to finish. Wait… scratch that… We aren’t finished yet, and hopefully never will be.